This page contains a brief description of the differnet types of materials that we can supply. If a material isn't listed we may be able to supply it on request. from our professional staff about any matter regarding materials for a specific project, then please Contact us at any time. C&W Knight has been committed to customer service since 1886. We are here to help you, whether you are engaged in a major civil engineering project, or merely refurbishing a long neglected garden path. With many classifications of materials available, it can be difficult to know where to start looking to find the one that is right for you. 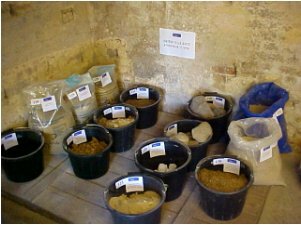 The Chapel Sample Library at our offices in Fenny Compton contains a large selection of granites, basalt, hard and soft limestones, crushed slates, sands and gravels. 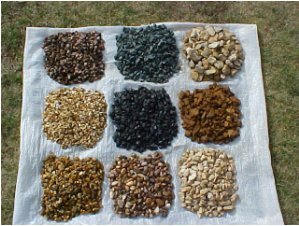 From these materials one can select road making materials, dressings for driveways and footpaths, decorative aggregates for all purposes, sands for mortaring and block paving - the choice is enormous and yours to make, though we are always on hand to offer advice as to suitability and compatibility. As well as the materials described above, we are also able to supply our customers with a range of specialist products. For equestrian applications, whether your requirement is silica sand for an arena, or ironstone for a "soft" hard standing, we can deliver the material for you. 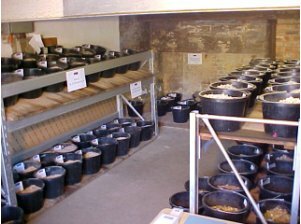 We also have samples of sands for golf courses and horticulture, and a range of self setting materials for footpaths. Many people now appreciate that aggregates do not just belong on building sites, and that they can play a major part in exciting new themes and designs in our gardens. With this in mind we have actively increased our selection of decorative aggregates, offering different colours, textures and sizes to suit most tastes. If you already have a sample of something you really like, why not ask us to try and match it for you? From several thousand tonnes for a new housing development or factory, to just half a tonne for a garden path, C&W Knight has the expertise and flexibility to help you successfully complete your project. We offer competitive prices and friendly, professional advice. Never done this sort of thing before and not sure how much you need? Don't worry; we can work that out for you as well, even coming to your project to measure up for you if necessary. We can even arrange to have material spread for you to rather than having to do it yourself, or have your old drive refurbished or a completely new one constructed.